The present Condition of our Work-house is this. There is a Charity-House convenient for this Purpose, into which the Officers of the Parish put such Poor as are willing to go, upon Condition that they carry their Beds, &c. in with them, and do that Work they are capable of doing, the Produce of which goes towards their Maintenance, which is very good as to all Necessaries; some of the chief of the Town being by Turns their Proveditors. Those that will not comply, are deny'd the usual weekly Allowance of the Poors Rate, and that Money apply'd to the Use of the Work-house. I take it to be a very good Undertaking, to which the Poor will be reconcil'd in Time; and already we find our Poors rate much lessen'd, and few common Beggars at our Doors; but really at present, those, that have been in, get out as soon as they can, and few others care to enter; tho', as I said, very well provided for in all Respects: But there is something, as they think, wanting, a little Money to buy Tobacco, Gin, &c.
A few Years since, the Inhabitants finding their Poor to increase, and thinking the neighbouring Justices too favourable to those who make Poverty a Cloak for Idleness, thought fit to make Tryal of that Expedient which the Wisdom of the Nation seemed to recommend for the Relief of the Poor, and to the Ease of Parish-Officers. They therefore hired a convenient House, which they furnish'd with all Sorts of necessary Goods, and then admitted as many into it, as were truly necessitous from Age or Accidents ; but as from the first it was called a Workhouse, many who before had feigned Necessity, and others who were frightned with the Thoughts of Work, chose rather to quit all pretensions to a Maintenance, than run the Risque of a strict Examination, or the Hazard of being industriously employ'd. This House is under the Direction of a Governor, who has a Weekly Salary for his Trouble ; he provides all Necessaries for the Family, and employs those who are under his Care, in such moderate Work, as their Age, or Inclination, or State of Health, will reasonably admit. The Produce of which, as in Justice it ought, is apply'd to the Use of the common Houshold. There are generally from ten to twenty in the House, some not yet grown to the Years of Discretion, others in a great measure superannuated, who, as they have no Reason, never make us uneasy with Complaints; for how can the Extremes of Age be made more easy, than by such a Method, from which all are provided with Lodging and Cloaths, suitable to their Station, and a never deprived of convenient Food. If this Method of maintaining the Aged, and the Ignorant, be not less expensive to those who support it, (of which I am as yet no competent Judge) I am sure it is more creditable, that the Poor should be kept under good Regulation, and to the Poor it must needs be much more comfortable, if Assurance of Relief, or company in Affliction, does ever minister a Cordial to the Distrest. Between about 1773 and 1835, a parish workhouse operated on Letchmore Road in Stevenage. The building, now used as offices, dates back to the late 15th or early 16th century. Prior to its adoption as a workhouse, it was a butcher's dwelling and mentioned in 1773 as Scott's Slaughterhouse. A parliamentary report of 1777 recorded parish workhouses in operation in Baldock (for up to 45 inmates), Codicote (20), Hitchin (80), Ippollits (20), Offley (30), Pirton (40), and Paul's Walden (20). 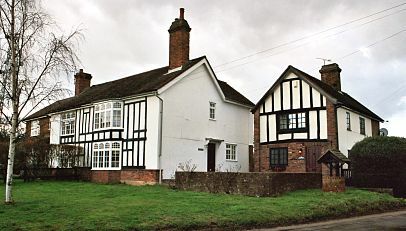 A house (now two houses) on School Lane in Great Offley is said to have sometime served as the Offley parish workhouse. Great Offley parish workhouse, 2003. County of Hertford: Baldock (2), Bygrave, Caldicott, Clothall, Codicote (2), Graveley, Hexton, Hitchin (4), Ickleford, Ippollitts, Kimpton (2), Knebworth, Letchworth, Lilley, Newnham, Norton, Offley (2), Pirton, Radwell, Shephall, Stevenage (2), King's Walden (2), St Paul's Walden (2), Weston (2), Willian, Great Wymondley, Little Wymondley. Later Additions (all from 1894): Langley, Preston, Walsworth. The population falling within the Union at the 1831 census had been 20,639 — with parishes ranging in size from Caldicott (population 39) and Letchworth (76) to Hitchin itself (5,211). The average annual poor-rate expenditure for the period 1832-35 had been £12,315 or 11s.11d. per head of the population. A new Hitchin Union workhouse was erected in 1836 on Oughton Head Way in Hitchin. In 1835, the Poor Law Commissioners authorised an expenditure of £3,019.15s. on construction of the building which was to accommodate 250 inmates. Designed by Thomas Smith, the workhouse did not follow any of the common plans of the period although it has some similarities to the Poor Law Commissioners model "square" or cruciform plan published in 1835. The workhouse's location and layout are shown on the 1851 map below. In 1881, a model of the workhouse (now in Hitchin Museum) was made by Alfred Fowler. Fowler was the workhouse's Industrial Trainer from 1877 until 1882, and then Master from 1882 until 1903. Later additions to the buildings included a new hospital block at the north of the site in 1886. The later site layout are shown on the 1922 map below, by which time the site had become officially known as Hitchin Poor Law Institution, also known as Chalkdell House. 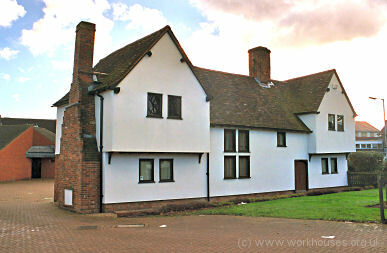 After 1930, Hitchin workhouse became a Public Assistance Institution under the control of Hertfordshire County Council. From 1943 until 1972 it was known as the Lister Hospital and then became Hitchin Hospital, the bulk of which closed in 1992. 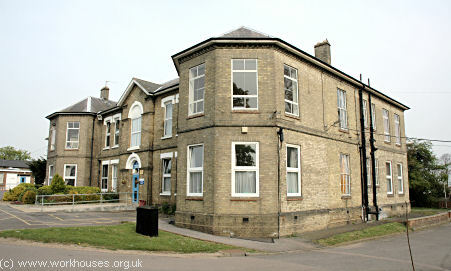 Most of the buildings have now been demolished although the 1886 infirmary survives as Laburnum House (Hitchin Hospital), providing care for elderly patients. In 1910, the Hitchin Union established children's cottage homes at 28-32 Ridge Road, Letchworth, where 28 children could be accommodated. By 1929, the homes had moved to 'Briar Patch' on Briar Patch Lane, Letchworth, with space for 40 children. 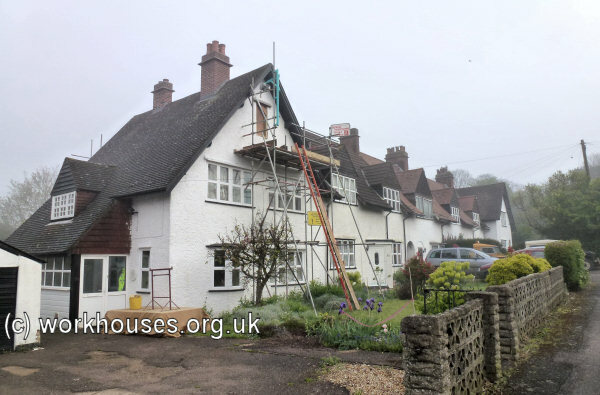 Former Hitchin Union cottage homes, Ridge Road, Letchworth, 2014. Hertfordshire Archives and Local Studies, County Hall, Pegs Lane, Hertford SG13 8DE. Holdings include Guardians' minute books (1835-1930); Ledgers (1835-53, 1882-1930); etc. An Account of Several Work-houses for Employing and Maintaining the Poor. Anon, 1732.